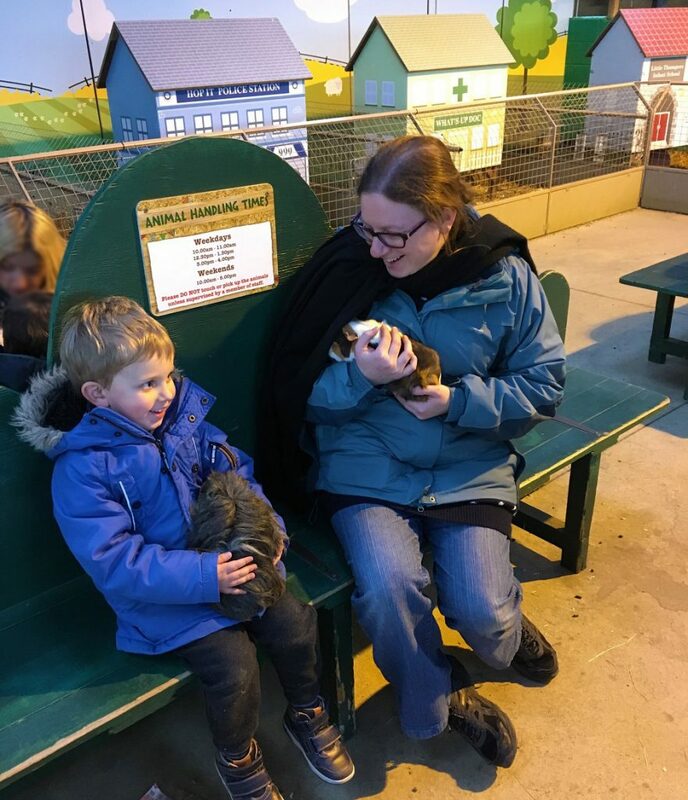 ‘We were delighted to win the Little Bird competition for tickets to Willows Farm Santa Spectacular, however, there has been a rather unexpected repercussion to our wonderful day out. Read on! 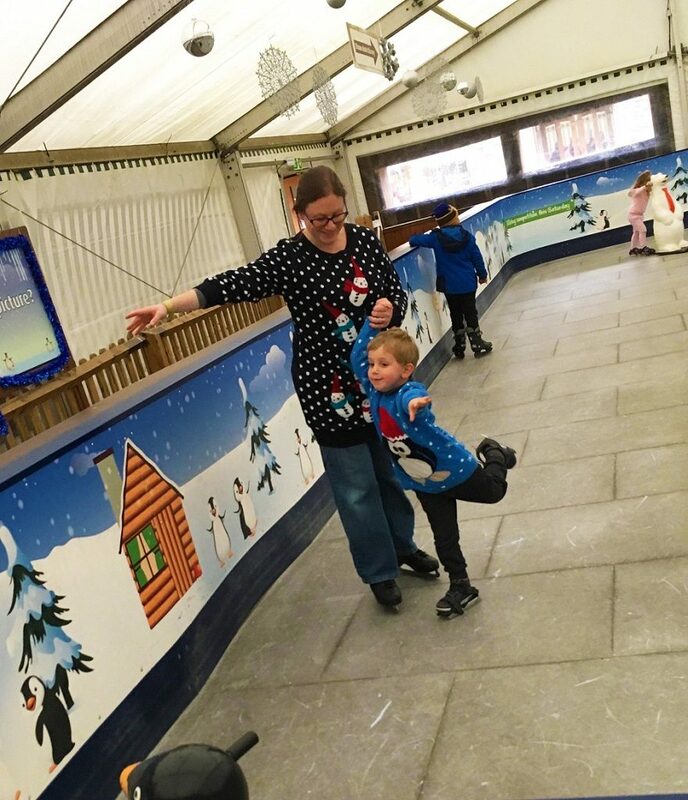 Last weekend I found myself attending Elf Academy and learning the ‘elf-a-bet’, discovering astonishing facts about reindeers, giving Father Christmas a high ﬁve, wobbling around an ice rink, and, most importantly, cuddling a very sweet guinea pig. These are just a few of the activities on offer at the Willows Farm Santa Spectacular. Of course, when we ﬁrst arrived my little boy (4 and a half) refused point blank to engage with a single ‘Festive’ activity instead electing to throw himself over the (slightly perilously icy) Peter Rabbit obstacle course and then dig about in the extensive (and spotlessly clean) sandpit play area. All attempts to encourage him towards the ‘Create a Cuddle’ workshop, where you stuff your own reindeer toy, or even to meet Santa were ignored in favour of some of his other favourite activities (he has been to Willows Farm before). Eventually he was encouraged to attend the Elf Academy and then the Christmas Spirit seemed to ﬂow a little more freely. We were all utterly enchanted by the two adept and engaging young performers who taught us how to tiptoe like an elf, peek through windows, and make our smiles as wide as possible. Receiving his Elf Diploma opened the door to the rest of the experience and from that moment on he set about getting all the stamps in his Elf Passport (a cleverly thought out and nifty way of checking off the main activities on offer). We enjoyed every aspect of the day, particular highlights being the snowball shootout and festive wood ride. Praise is especially due to the creators of Santa’s beautifully designed grotto – magical, twinkling festive scenes which have clearly been put together with love and care. Meeting The Man himself was excellent as he put my rather nervously awestruck child at ease with perfect Kris Kringle kindness and they had a good chat! There were many activities we didn’t get to but with an older (or more compliant) child I am certain they would have been just as excellent as the things we did accomplish. The only room for improvement I can suggest is in the cafe – for lunch, we tried the festive specials and whilst my brie, bacon and cranberry panini was mostly acceptable, my husband’s chicken and stufﬁng baguette was 90% stufﬁng and signiﬁcantly below par. However, in an otherwise marvellous day we can forgive some underwhelming catering. The great thing is that the cafe is in a giant indoor soft play which the small boy was happy to bounce around in, giving his parents a brief moment to say ‘hello’ to each other during the hours of daylight. We ﬁnished our day with a viewing of the 3-D ﬁlm which my little one absolutely loved and would have watched many times over had he not been equally keen to get home and play with the toy he chose from Santa’s toy shop. Willows Farm is to be praised, not just for designing a relaxed and happy festive experience perfect for toddlers as well as older children, but also for how spotlessly clean the farm and activities are, for how polite and friendly the staff are, and for how well looked after the animals clearly are. It’s one of our favourite local destinations and I’m certain we’ll be returning in the New Year. Be sure to check out our LittleBird competitions page for the chance to win great prizes!